This tutorial is for those that have a working knowledge of PSP. This tutorial was written by me in July 2011 and any resemblance is purely coincidental. I use PSP 9, but any version should work. I do not allow my tutorials to be translated and please do not claim them as your own. If you would like to share the tutorial please send a link to my blog. Thank you! Tube/Image of choice: I am using the work of my all-time favorite and talented artist PINUPTOONS! You can purchase his work here at CDO though I bought mine at the former CILM. 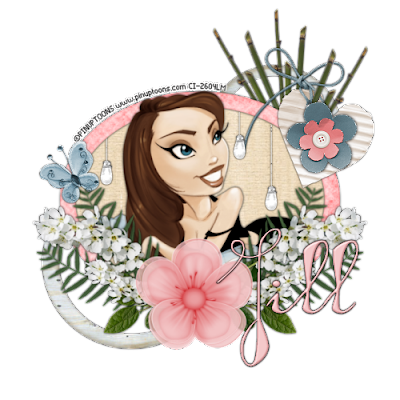 Kit of choice: I am using Created by Jill’s’ ShadesofRion6 which is a PTU kit which you can purchase from her store here. 1. Open a new image 600 x 600 (we can resize later), we will call this our working image. 38. Now I was happy with that layout but later I went back and added more to it. So you can end here or continue on if you want the tag you see here. 47. Paste as a new layer on our working image and move into place to make it look as if it is poking out the top of the newest frame. 48. I added the butterfly and lights too but you don’t “have” to do this.